HISTORY — OHDH COLOR CO. It all started with a 3-megapixel camera. Chicago, IL. 2006: Officially the first digitally captured image of the city. It should be noted: The grass in the shot was not an "artistic" choice. Due to not having a tripod at the time, the camera needed to be placed on the ground in order to capture any resemblance of buildings. Without being held completely still, any image taken while in low lighting immediately turned into unintelligible streaks of light. Not in a cool way either. Consequently, it was this low lighting/light blur glitch that would lead to the idea of intentionally using the camera as a color palette generator. Notice the brownish tones of the image. Not a regular occurrence. A unique display due to cloud coverage that evening along with the time of year. If you observe the lights, you can already see a nice range of color. Should make for a solid color palette. Let's begin. FIG.2: Range of colors pulled directly from Belmont Harbor image. Many people shun gradients, and that's understandable. There are rules to using them that not everyone adheres to. When the wrong (or just too many) colors are forced to play together, it ruins the vibe and fun for everyone. Here's a little secret. Everything you need to know about gradients and how to use them properly can be learned by observing Mother Nature. A lesson in color theory couldn't hurt either. FIG.5: What you have now are the beginnings of an experiment in branding. 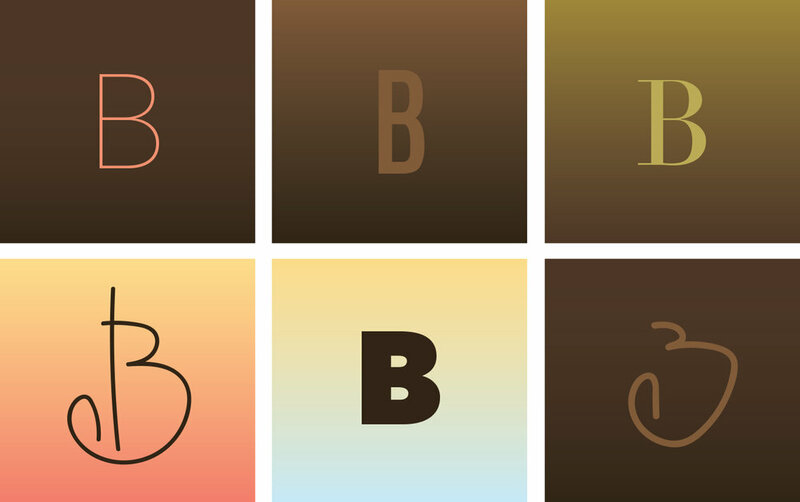 This palette could easily be the basis for a chocolate or coffee project. Once you nail down a typeface... a logo can't be far behind. A quick introduction for the unfamiliar, there are two terms that are referenced throughout this site: Color Mining and Hexadecimals. Color Mining is a term specifically given to the process of gathering colors and color palettes from photographs. Hexadecimals, generally associated with HTML and websites, are a six-digit sequence of numbers and letters following a pound sign and are used to represent specific colors. For example, when using hexadecimals, #FF6600 represents a variation of the color orange. Let’s go back. The road to color mining and hexadecimals began during a 2004 holiday party raffle in Indianapolis, IN. That’s when and where a lucky ticket was drawn and an Olympus 3-megapixel camera was won. Now it should be noted that this camera was cutting edge at the time. It not only had multiple megapixel resolution, it also had 8x zoom, multiple capture settings and the ability to record video. It did take four AA batteries, but that was just a way of life. Regardless, it changed the game. During this time, much would be documented. Sunrises, sunsets, travels, family gatherings, festivals, carnivals, blue skies, cloudy skies, snowy skies, dark skies, general surroundings, street signs, road signs… to name a few. This was the beginning of an important time of discovery. Side note: It was during this time that the first digital images of the city of Chicago were captured. Atlanta, GA. // Barcelona, ESP. // Berlin, GER. // Boise, ID. // Braunschweig, GER. // Brisbane, AUS. // Brooklyn, NYC. // Frankfurt, GER. // Greensboro, NC. // Indianapolis. IN. // London, UK. // Mainz, GER. // Miami, FL. // New York City, NY. // Philadelphia, PA. // Springfield, IL. // St. Louis, MO. The most important advancement made at this time centered on perceived limitations of the camera and the way it captured images during times of low lighting. Two important points: 1. The camera had to be completely stationary and still while photographing in low light or else the image wouldn’t turn out. And 2. (Also most importantly) the zoom while photographing in low light would often glitch, causing the camera to capture an image before it fully focused on the subject. While these images were technically a mistake, what the camera ended up capturing would change the trajectory of future projects. It also changed the intended function of the camera moving forward. When an image is blurred to the point of only reflecting form and light, it contains within it a certain untapped potential. It becomes something altogether different, like an abstract catalyst or snapshot of a mood. It erases the detail of a specific location and becomes more about a feeling or emotion. A captured energy, if you will. You’re no longer talking about a certain city or part of town. If an image is blurred just enough, it could be a photo of almost anywhere. The viewer then gets to decide where that may be and how it makes them feel. It’s this concept that the camera zoom’s glitch introduced, ultimately leading to the realization that blurred images capture the relationship and transitions between light and color. You begin to see that a range of colors exist that you may not find in a super detailed shot. If you pay attention to this, what you’ll discover is a mine of potential. This is when a 3-megapixel camera becomes more than just a camera… it becomes the most amazing color palette generator one never knew they had. That creative energy mentioned earlier, it’s ever-present and it runs throughout the entire city. How far outside the city this energy actually reaches can be argued. Regardless, being surrounded by it on a daily basis, knowingly or unknowingly, it begins to permeate and influence one’s creative output. Chicago is a city of artists and producers and that encompasses every facet of creation. Design, Music, Food, Art, Entertainment, Athletics, Education, Business, Manufacturing … artists and producers are everywhere and they’re doing all kinds of things. You can’t help but be inspired by it. The flip side to living in Chicago and being surrounded by all of this creative energy are the periods of painfully cold gloominess that, if not prepared for, can and will take a toll. Vitamin D and frequency deficiencies are very real. Sometimes such droughts of light and color require you to make your own. Side note: Never be afraid to make your own light. It was during a period of such cold dreariness that OHDH COLOR CO. was initially conceptualized. Originally created as a way to generate positivity and advance creative momentum, it was the ever-growing collection of images and subsequent color palettes (thanks to the 3-megapixel camera) that served as the ignition, fuel and eventual bonfire of light. It was a time of random creative experiments, exploration and color hoarding. This is where things got real. Real functional. A chance viewing of Ray Kurzweil’s “Transcendent Man” introduced two revolutionary (at the time) concepts that would prove pivotal to the focus and direction of OHDH COLOR CO. The first being the concept of the Maker Movement, illustrated through 3D printing. What this showed was that, not only were manufacturing channels going to be changing drastically, but now anyone with an idea was that much closer to the ability to manifest that idea into something tangible. A point the masses still don’t fully understand. The second concept, which led to a major shift, was the idea of designing for the future regardless of the tools that are available to you today. Ray Kurzweil mentions working on projects and ideas for which the technology needed to complete them doesn’t currently exist. What?! Exactly. While such concepts hadn’t before been considered, or such a term as “Futurist” heard before, nothing would be the same after. Literally anything seemed possible at that moment. What does any of this have to do with images or colors you may be asking? Well, it has less to do with the actual colors and everything to do with their function and potential application. If a 3D printer could personalize manufacturing and turn the person with an idea into the actual source and distributor, it all of a sudden becomes possible to turn a collection of colors into a resource for others. If it’s possible to generate enough of your own light and positivity to get you through a Chicago winter, why not use technology to scale that into something that can potentially help others do the same? They say, “If you see something, say something.” Why not, “If you see something, make something?” That was the shift in mindset, and it seemed to be worth a shot. Why hexadecimals? Many options were considered while thinking about how best to share color. Hexadecimals are the answer because they’re a universal language with the ability to bridge communication gaps and language barriers for one. They’re consistent no matter where you are in the world. Sure they may look different from screen to screen, monitor to monitor, but that’s not the point. When you’re talking about color palettes, it’s less about the specific color and more about the way it works with the colors alongside it. Color palettes are collaborations, and that’s a good thing. Why print them then if you can’t perfectly replicate a hexadecimal using CMYK methods? As stated previously, color palettes are designed to work together no matter the output. If one is a shade off due to the CMYK process then they’re all a shade off, but they’re still working together. They still produce a sentiment. Also, once printed they then have an added dimension of functionality. It’s about the feeling or emotion you get when looking at the colors together. So, with the addition of thoughts, ideas or words, they become something different altogether. A reference, list, space for “Thanks,” thoughts, notes … However one chooses to use them is how they are supposed to be used. That’s why they’re printed. Again, it’s about turning positivity and light into connection and communication. Even though the trusty Olympus 3-megapixel camera would officially be retired at this time, its lessons and spirit would continue to be a part of everything that happened next. In 2014, a leap of faith was taken. Yves Klein “Leap into the Void” style. The funny thing about a leap of faith is that you traditionally don’t have any visual proof to accompany the leap, hence the “faith” in the equation. While this may be hard for some to believe, the city had actually been providing clues that such a leap should be taken. Between the continual build in the city’s creative energy and visual clues in the atmosphere, a final “00:00:00” signal for making such a leap was provided. What started as a way to generate positivity and momentum via a collection of blurry images was to be keenly refocused during this stretch of time. There were still images to be gathered and colors to be mined, but now attention was to be placed on a subject that had the ability to test one’s patience, persistence, durability and timing. The subject? Chicago weather. To be more specific, the transitional, and at times surprising and unexpected, moments of light and color that provide the backdrop to so many people’s Chicago experience. Deciding to capture these specific moments, especially during this particular time, would end up generating a uniquely special body of work — similar to how grapes of a certain year have a significant impact on the bottles of wine they eventually produce. Official confirmation that something exceptional had been in the works came on Wednesday, November 2, 2016. There are 108 different reasons regarding why this is so. Final side note: None of this has been created to go over anyone’s head. The intention has always been to create a platform for sharing what’s in one’s head. Hopefully others see a way to find and create their own sense of value. Be it through the art, colors or graphics. Write More. Make More. Create More. Relate More.